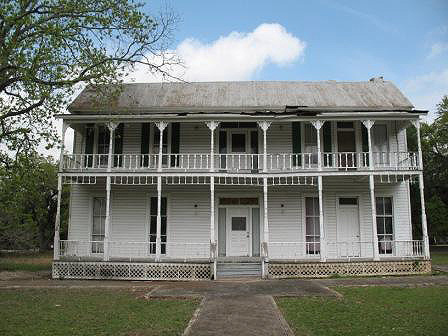 Before 1881, John Spettel, Jr. built a two-story house, featuring elaborate ornamentation and wrap around porches on the east bank of the Medina River. Spettel was a successful cattleman and built the house for his bride south of Mitchell’s crossing on the Medina River. Drovers herding cattle from Castroville to Bandera made their way toward the Great Western Trail used the house as a rest stop. In 1912, construction began on the Medina Dam which led to the flooding of the surrounding area, including the Spettel property. Spettel’s wife chose to save the house and the house was cut into two pieces and hauled to the location where it stands today. The house was relocated one portion at a time, and because hauling the first half by mules took nearly one month, the second half was moved with a steam engine. The Spettel family continued to use the house as their residence until 1925. The house was occupied by a subsequent family and by the mid 1940s, the former Spettel homestead was vacant. Beginning in the late 1970s, the property was owned by commercial enterprises and the land was used for camping. The house was used as a sales office and for recreation and meeting space. The Spettel House is one of the earliest structures in the Medina Lake region but remains unused and is showing signs of advanced deterioration. The Medina Lakeplex is an enclave of several small settlements that are working to preserve and promote their heritage and they are concerned about the lack of plans for care and use of the house. Bringing attention to the history of this community, will boast the efforts of those working to preserve the Spettel Riverside House.